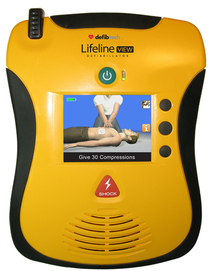 The Defibtech Lifeline defibrillator is easy to use and very reliable. The dual battery feature assures the unit is ready when you need it. 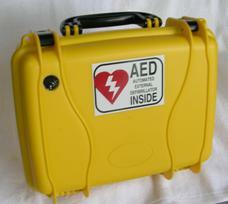 The defibrillator comes with a standard eight hour main battery and a lithium 9v battery for system testing. An additional spare adult electrode pad set is also included in the kit. They can be used in an Office, School, Church, Warehouse, Factory, Hotel Museum, Theater, Gym, Nursing Home, Gallery. Defibrillators are needed at any location where people gather. is packaged in a durable, air tight polypropylene hard case with a Lexan inspection window. This allows you to check the defibrillator status daily without opening the case and exposing the unit to moisture and mildew. The package is compact for easy storage yet contains the materials needed in an emergency. is easy to use and very reliable. The dual battery feature assures the unit is ready when you need it. 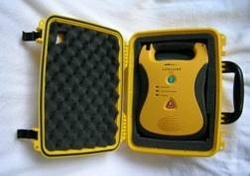 The defibrillator comes with a standard eight hour main battery and a lithium 9v battery for system testing. An additional spare adult electrode pad set is also included in the kit.